Adelaide City Football Club has been awarded the City of Adelaide Rebel Sport Club of the Year in a gala function held at the Adelaide Town Hall last night. “The award is a reflection of the hard work and commitment shown by the many volunteers at our club” said Lacey. The City of Adelaide Sports Awards have been held to celebrate those who have encouraged and inspired people to get involved in sport, as well as those who have been successful in their chosen sport. 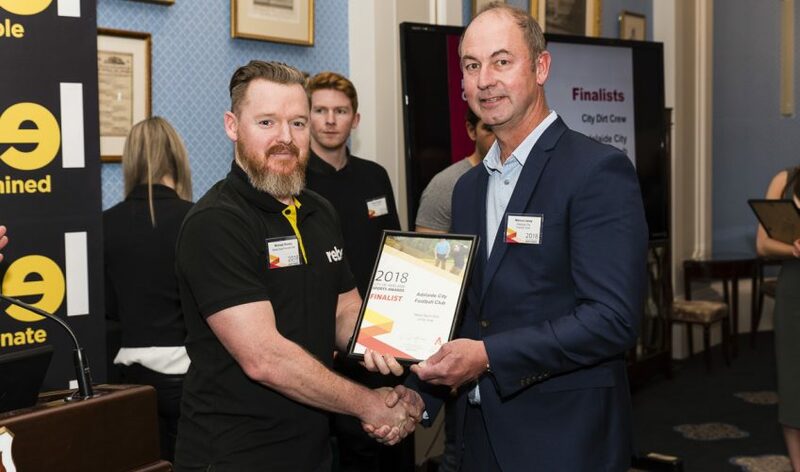 This is the fourth year that the awards have been held and is part of the City of Adelaide’s goal to increase wellbeing and encourage more people to be physically active in the city. The event has once again been timed to coincide with National Volunteer Week. Sunday Mail sports columnist Ben Hook hosted the event which was attended by the nominees and their friends and families. City of Adelaide Councillor Natasha Malani welcomed guests and nominees on behalf of the Lord Mayor Martin Haese, and presented the Event or Program of the Year and the Contribution to Lifelong Physical Activity awards. Councillor Malani was full of praise for a scheme that recognises hard-working sports people and organisations in our local community and celebrates our local sporting heroes. “It’s Council’s great honour to recognise the contributions of individuals and organisations that make a huge difference to the health and well-being of people in the City of Adelaide,” Councillor Malani said. The City of Adelaide would thanked sponsors; John Cranwell from Inclusive Sport SA, Michael Sheeky from Rebel Sport Rundle Mall and Marg Green from Beyond Bank.